Train orders for Santa Fe locomotive no. 2826 tied in string await pickup by the crew of a westbound freight train approaching the depot at Ottawa, Kansas, on August 10, 1963. © 2018, Center for Railroad Photography and Art. Abbey-05-091-009. The exhibition Wallace W. Abbey: A Life in Railroad Photography stems from source material drawn from the book of the same title (Indiana University Press, 2018). To celebrate the publishing of Abbey’s gorgeous display of black-and-white images and to honor the generous donation by the Abbey family of more than 35,000 slides to the Railroad Heritage Archive, the Center developed this exhibition. A lesser-known figure in the railroad photography community, Abbey transitioned his profession from journalism to public relations over the course of his forty-year career. Through Abbey’s various career changes he never lost the initial passion that fueled him at first as a young boy of thirteen photographing Frisco Line freight trains in his grandparents hometown of Cherryvale, Kansas, all the way to his retirement in Pueblo, Colorado where he passed his time at the Association of American Railroad’s Transportation Technology Center. His unique role as a photographer, journalist, historian, and railroad industry executive allowed him to capture often overlooked perspectives spanning primarily from the 1940s through the 1970s. In addition to documenting corporate promotional images for his positions at Trains and later the Soo Line, Abbey frequently took steps beyond his assignments to shoot the human elements of railroading and to add his own artistic angle. Abbey’s masterful skill combined journalism and artful vision to help people from differing backgrounds understand and appreciate the world of locomotives, passenger trains, big-city terminals, small-town depots, and railroaders. He witnessed and photographed the sweeping changes in the railroad industry following the shift from steam to diesel locomotives, and showcased the transformation of transportation and photography after World War II. The exhibition Wallace W. Abbey: A Life in Railroad Photography serves as a platform to present the life work of one of America’s most dynamic railroad photographers. Abbey offers a full understanding of all aspects of railroading and delivers his visual ideas in an exciting presentation enjoyable to the railroading community and the general public alike. 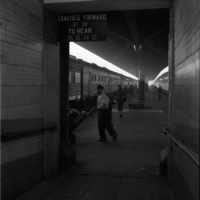 Viewed through a doorway leading to the Track 4 platform at Cincinnati Union Terminal, a “red cap” hurries a handcart loaded with suitcases toward New York Central’s James Whitcomb Riley as passengers hustle to board the Chicago-bound streamliner. © 2018, Center for Railroad Photography and Art. Photograph by Wallace Abbey. Abbey-09-106-08. To book a showing or get more information, get in touch with the Center at 608-251-5785 or send an email to info [at] railphoto-art [dot] org. 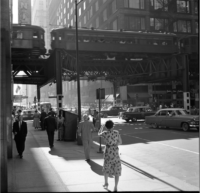 Pedestrians walk briskly along the Loop in downtown Chicago, heedless of an “L” train rumbling overhead on a summer day in 1957. Photograph by Wallace Abbey. © 2018, Center for Railroad Photography and Art. Abbey-04-018-005.